The CNA salary in Wisconsin, as on January 2015, was $22,000 as per the statistics provided by indeed.com. This amount was 11 percent less than the average yearly wages of a CNA nationwide. A survey conducted by the US Bureau of Labor Statistics shows that Wisconsin employed 37,240 certified nursing assistants, in May 2013. At the same time, employment per thousand jobs was 13.77. The average hourly and annual wage of nursing aides in WI was $12.61 and $26,230 respectively. 90% of nurse aides received less than $33,940 while 10% made more than $33,940. 75% of certified nurse assistants earned less than $29,440; remaining 25% earned more than $29,440. 50% of the employees were waged less than $25,770; rest 50% earned more than $25,770. 25% of CNAs were paid annual wages less than $22,370; 75% were paid more than $22,370. 10% of employees were salaried less than $20,370; 90% were compensated more than $20,370. 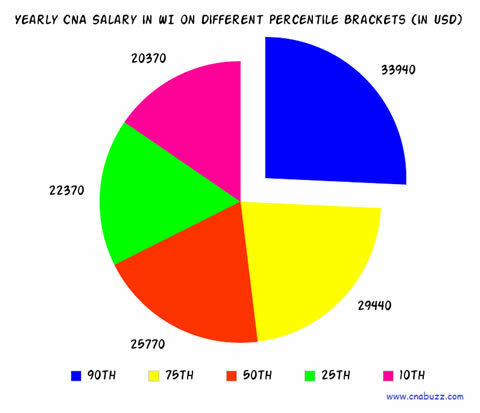 In the state of Wisconsin, the salary of a CNA in different cities varied between $26,137 and $30,919. Janesville was the highest paying city that offered median annual and monthly salary of $30,919 and $2,577 respectively. The hourly wage in this city was $15 while weekly salary was $595. Certified nursing assistants in La Crosse received the lowest annual remuneration of $26,137. The hourly and weekly wages were $13 and $503 respectively. The demand of CNA is high all over the country; therefore, they are paid hefty salary packages. In Wisconsin, CNA Hospice offered the highest annual salary of $28,000. The second highest paid job titles were CNA Rrmc and Medical Assistant Family Practice with earnings of $26,000 per annum. Correctional Prison Facility CNA received the lowest income of $13,000 annually. With an expected growth of over 21% in the years 2012 to 2022, 312,200 new openings will be generated for certified nursing assistants. This information provided by the Bureau of Labor Statistics reveals that growth of these workers is faster than average for all other occupations in USA. Therefore, there will be excellent job opportunities for CNAs in the impending years. However, due to high turnover rate and staff shortage, presently working nurse aides experience heavy workload. Question 1 – What is the annual salary range in the different cities of Wisconsin? Answer – In WI, the annual salary range of certified nursing assistants ranged from $26,137 to $30,919. Question 2 – Can anyone suggest me some top paying job titles in the state of WI? Answer – CNA Hospice is the topmost paying job title that provides a salary of $28,000 to the certified nursing assistants. Other job titles include CNA Rrmc ($26,000), Medical Assistant Family Practice ($26,000), CNA Medical Surgical ($24,000), CNA Float Pool Riverbend ($23,000), and CNA Neurology Riverbend ($23,000).